If you like fat dividend yields, you need to go in with your eyes open. Here are five things to keep in mind -- always! 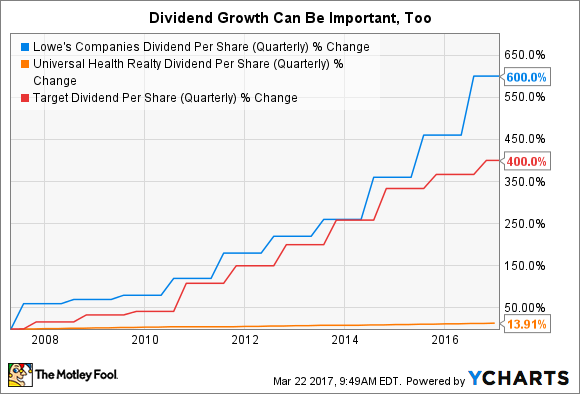 If you are like me, you love dividends. And there's nothing more enticing for investors like us than a high-yield dividend stock! There are good reasons to like dividends, but you need to think about what a high yield means and take that into consideration before you pull the trigger on a high-yield stock. The first and most important thing to remember about a stock that has a high yield is that, well, there's probably a reason. For example, home heating distributor Suburban Propane Partners LP (NYSE:SPH) has a massive yield of more than 13%. That's because there's a very real risk of a distribution cut. Cash levels have fallen by over 95% since late 2015, and business has been weak recently because of warm weather. This doesn't mean the distribution will be cut, but you can't look at Suburban Propane's yield without at least considering the risk that it could be cut. Another company that falls into this category today is Target Corporation (NYSE:TGT). The giant retailer's shares yield around 4.5% currently. Competitor Wal-Mart Stores (NYSE:WMT) has a yield of around 3%. You have to ask, why the difference? In this case, Target's same-store sales fell in the all-important holiday season, and the company is calling for more declines in 2017. It's basically struggling to adjust to a fast-changing retail landscape. Wal-Mart appears to be holding up better, with same-store sales increasing over the Christmas shopping period and the company making aggressive moves like the acquisition of Jet.com. If you are like me, you are fond of companies that increase their dividends regularly. It shows that the company believes it's important to return value to shareholders over time. And the decision to increase dividends is also a statement that management believes the future is bright. 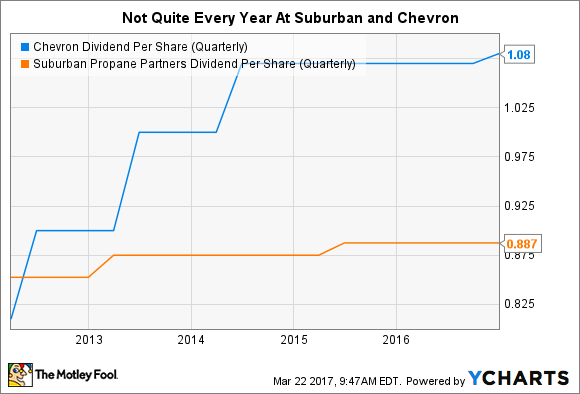 But Suburban illustrates another fact: Dividend streaks can end. Suburban Propane had increased its distribution for 14 years, but hasn't upped the distribution since the second quarter of 2015. There's a risk that the annual streak will end if the company doesn't declare an increase this year. Long dry spells like this one can be an indication that the dividend is at risk, particularly when the trend is paired with the cash burn on the balance sheet at Suburban. Compare that to Target, which has a streak of 49 years. And it hasn't missed a beat when it comes to annual increases. Target's better financial shape relative to Suburban makes all the difference here. The takeaway is that just because a company has a history of increasing its dividend doesn't mean it will continue. You have to look more deeply to see what's going on at the company and whether it is well-positioned to handle adversity. But streaks can lie, too, and Chevron (NYSE:CVX) is the perfect example. The oil major didn't increase its dividend for 10 quarters (over two years) but still maintained an annual streak of 29 years. It was the timing of the increases that allowed the annual streak to survive. This is just another example of why you need to analyze the information behind the headline number when it comes to dividends. An important piece of the puzzle when it comes to big yields is understanding one's self. You need to ask yourself, essentially, what is it that a big yield is doing for you? If you are looking for income, then you like dividends because you can live off of them today. However, you have to keep in mind the three points above. Sometimes a big yield means a big risk, and that could leave you with less income in the long run if you reach for yield. You have to know your investing needs well, or you could continually fall into high-yield traps. That said, it's important to note that a big yield can also be an indication that the market is overreacting to bad news, leaving an entire sector out of favor and its constituent companies with high yields. In this case, the dividend yield is a tool identifying investment opportunities. Retail is a good example. Target is just one high-yielding retailer. L Brands, with a nearly 4.9% yield, and Stage Stores Inc, with a massive 28% yield, are two more. Although the industry is facing big risks, some retailers will survive and thrive and the large number of high yields means retail is probably worth a deep dive for dividend investors. Which brings up point No. 4. A company's yield can also provide a rough estimate of valuation. 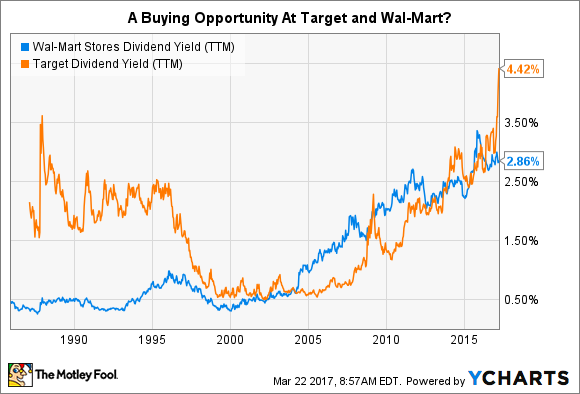 For example, Target and Wal-Mart both have yields at the high end of their historical ranges. Based on the retail discussion above, that makes sense, but each still appears relatively cheap right now in the context of their respective histories. Then there's Chevron, which we looked at earlier, and its roughly 4% yield. That's slightly higher than the norm for this oil giant, but not so far removed as to suggest a huge opportunity. In other words, just because a yield looks high on an absolute basis, it doesn't mean you're getting a bargain. .
You can't use yield as your exclusive valuation tool, but don't overlook it either. It can tell you a lot very quickly. Now I'm going to challenge you to question everything you love about high-yield dividend stocks. A big yield is wonderful for today, but it can be a disaster for tomorrow if dividend increases (assuming there are increases) don't keep up with inflation. For example, Universal Health Realty Trust has a 10-year annualized dividend growth rate of just 1.8%, with shorter periods at about that level, too. That's not enough to keep up with inflation, which has averaged around 3% over the long term. The stock yields around 4.3% today. Meanwhile, retailer Lowe's Companies (NYSE:LOW) yields only 1.7%, toward the high end of its historical range, but the dividend has been growing at around 20% a year. To give you an idea of just how powerful that is, a decade ago the quarterly dividend was $0.05 a share per quarter. Today Lowe's pays $0.35 a quarter. A fast-growing dividend can make up for a lower yield and help protect you from the ravages of inflation. Thus, the lower yield might be the better option in this situation. LOW Dividend Per Share (Quarterly) data by YCharts. But there's a middle ground, too. Target yields 4.4% and has a 10-year annualized dividend growth rate of 18%. Growth over shorter periods is lower, but the dividend grew roughly 7% over the past year despite the headwinds the company is facing. The dividend is telling you there are real risks at the retailer, but it's also saying that it could be an opportunity, too. Add in the historical dividend growth and you might decide that the extra risk is worth it. The real issue here, however, is to make sure you don't get suckered in by a high yield that isn't going to keep up with inflation. That could leave you poorer in the long run even if the dividend doesn't get cut. By now you should realize that I love dividends and high yields, but I don't think they are a magic investing bullet. Yes, they can get you headed in the right direction, but if you don't go in with your eyes open to the risks, they can also lead you astray. Next time you look at a high yielder, keep these five points in mind before you blindly hit the "buy" button.